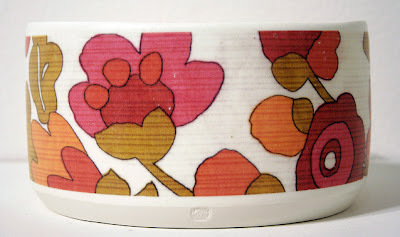 I may have to declare this month South Australian Ceramics month on my blog. It seems like every time I turn around another one is popping up doing something or other worth writing about! This time it’s the eminent Gerry Wedd, who you might notice is now included in my list of ceramic blog links. It seems Gerry wears a lot of hats – ceramicist, surfing champ, cartoonist, jeweller, clothing designer for mambo etc etc – but everything he does is infused with a great sense of humour and wit and a good dose of social commentary. I was lucky enough to catch his show WILLOW at Craft ACT a while back, and loved it. 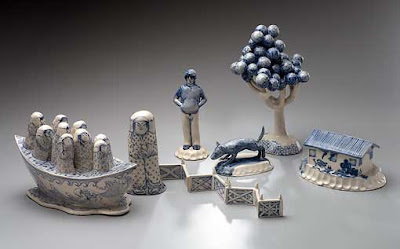 In his recent work he has taken the classic blue and white patterns used in ceramics and created his own very unique and very Australian interpretation! Lots of Australian icons and imagery - the ceramic thongs (that’s a shoe, not underwear, for you non-Australians!) being one of my fav’s! So make sure you check out his new blog - Weddwood! 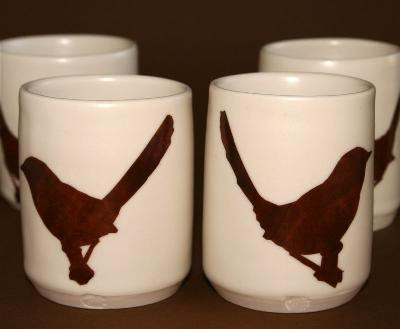 And seeing as its aaaaalll about South Australia, here's a couple of pics of another top shelf South Australian ceramicist - Marie Littlewood's beauuuuuutiful beakers. Love em! 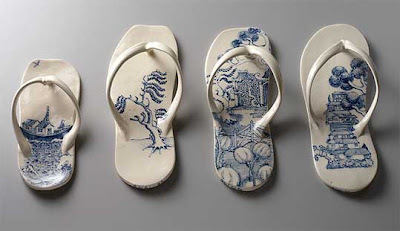 Those Willow pattern thongs are divine! I love that upside down thing of mixing really familiar icons in odd ways.